In my heart I want to be a long distance hiker. I feel a tug that pulls on me with supernatural strength to be on the trail. It’s not a yearning that stems from a lacking or because I need to find myself. It is simply a desire to be out in the woods as much as humanly possible. This is my first attempt at a long trail. Packed to the brim with 5-6 days of food, my brother-in-law, Doug and I started at Table Rock State Park with the intention of hiking 76 miles south to Oconee State Park. The trail starts at Table Rock with a wonderful set of little creeks and waterfalls, a mere foreshadow of the coming terrain. The steepness begins at once and we started the 2200′ climb to Sassafrass Mountain. The first thing that became self-evident on the Foothills is the meticulous grooming and marking. It is virtually impossible to walk 10 feet and not see a freshly painted white blaze. 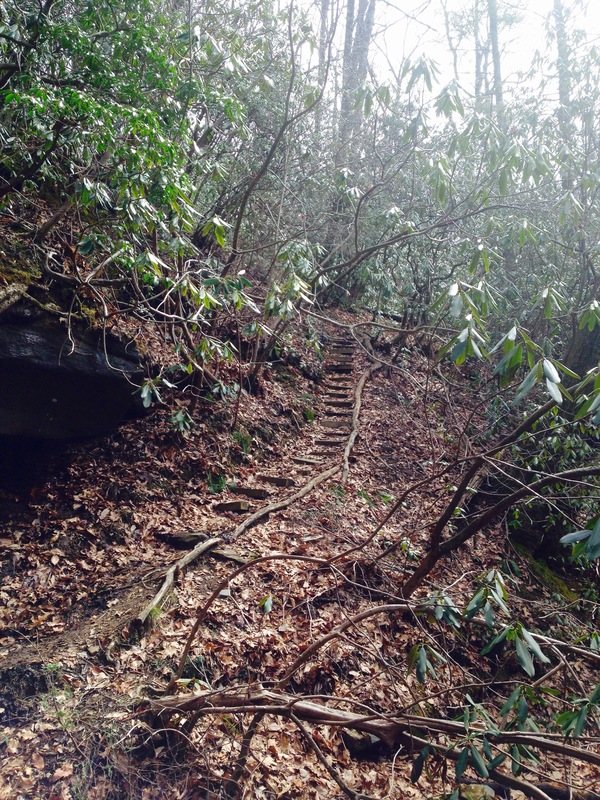 At every steep portion where we thought we would have trouble on the trail, steps are placed for the hiker. After a couple of miles we stopped at a small waterfall to drink some water. 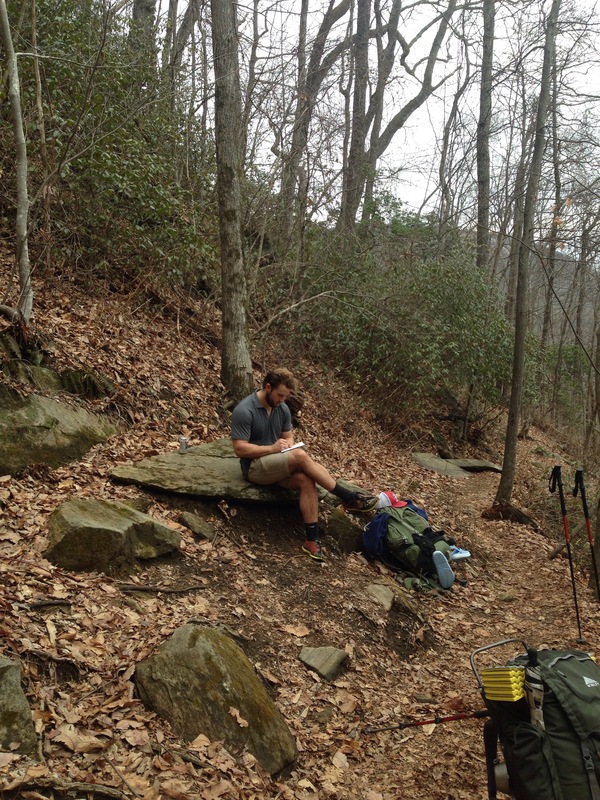 As I took in the scenery Doug began his journal of the trail experience. The switchbacks continued up the mountain going past impressive rock formations. 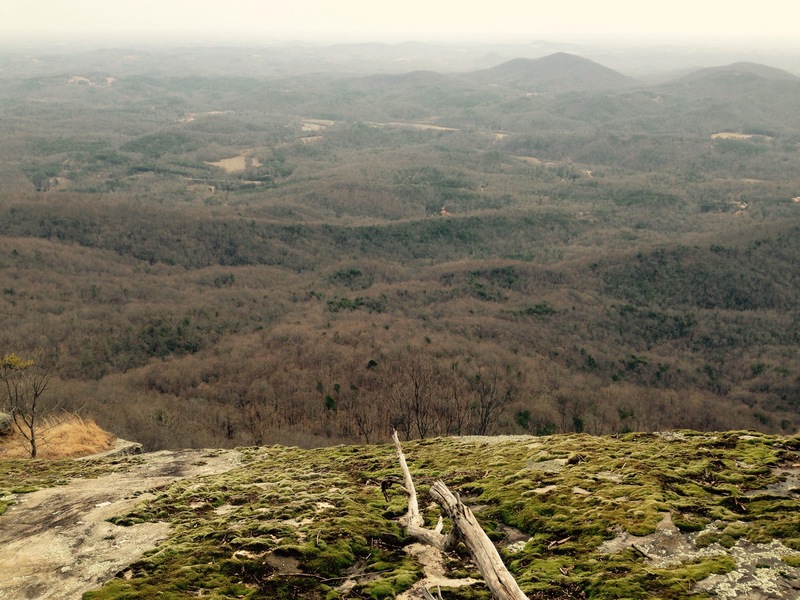 At three and a half miles the trail summits a side of Pinnacle Mountain and we had stellar views of South Carolina. After a slight climb from the side of Pinnacle Mountain, the trail descends again and comes to beautiful rocks at Drawbar Cliffs. The trail crosses several creeks and bridges and after several miles of very pleasant terrain, we started uphill. 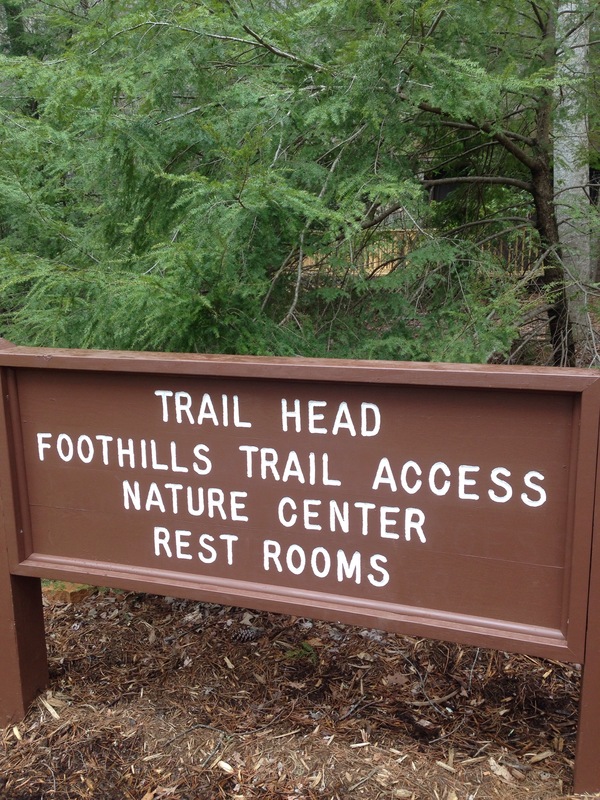 Doug and I purposefully planned on only hiking 8.6 miles the first day so the we could camp at the John L. Cantrell homestead site. 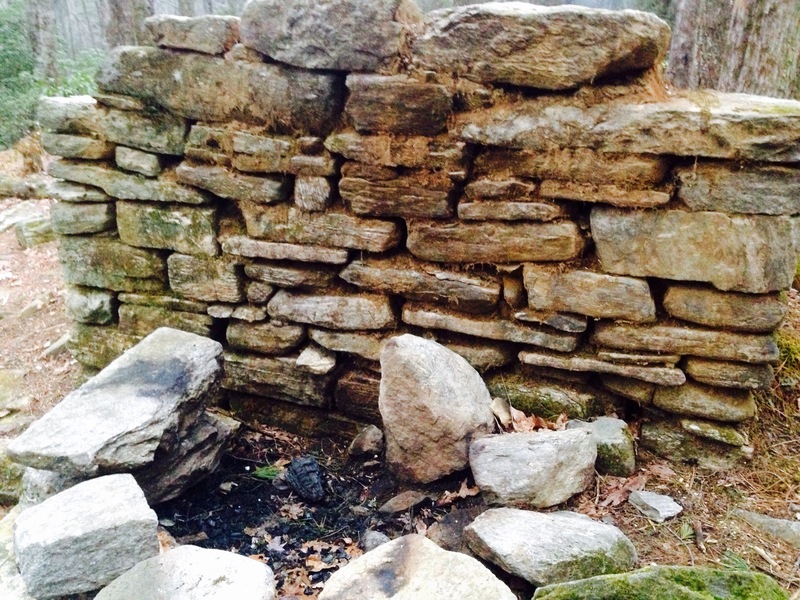 The remnants of the settler’s cabin are still present as is an old spring box, surely used by Mr. Cantrell himself. 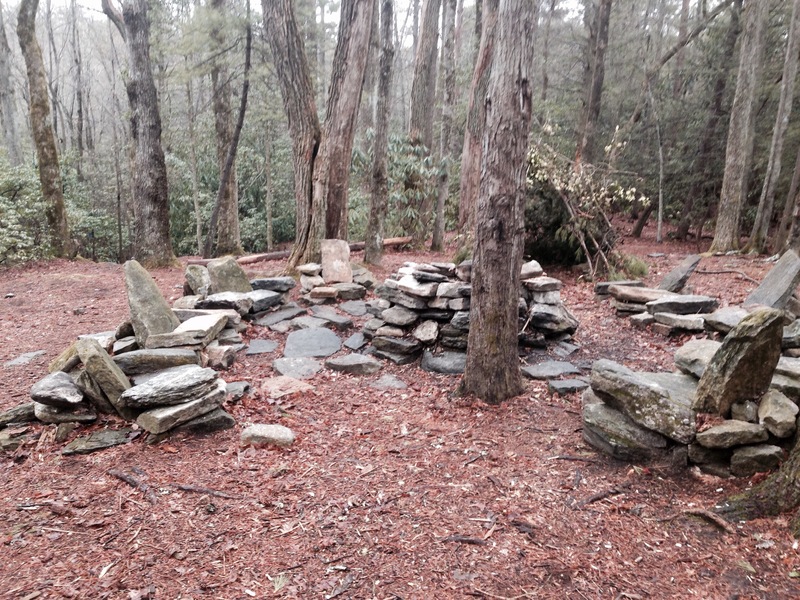 The biggest reason to stay at this site is the rock chairs that some industrious person or group built around a campfire ring. We also happened upon two really good guys on spring break from the University of South Carolina, Ben and Justin (Bernice and Justina) whom we shared some good laughs and a fire on the first night. After finishing dinner, I climbed into my tent to read some Faulkner to the pitter patter of rain.